- 殘編 (Tanya Hsu) on 十月 31, 2017. Toronto’s own Jewellery designer and maker Anne Sportun brings professionalism back to fine jewelry. Among the many jewelers in Toronto’s fashion district, Anne can easily be the most qualified. With an unstoppable passion for jewellery since teenage, Anne Sportun deferred her archeological studies to enroll in a three-year goldsmith program in jewellery arts where she acquired her formal goldsmithing skills. Anne continued pursuing her dreams and founded her brand in the 1980’s with the opening of her first atelier in Toronto. With such a strong and solid base, Sportun embarked on a long, beautiful journey and a career that has continued to evolve and prosper over the past 25 years. Even after thirty years, Anne has never once grown sick of jewelry & fashion; in fact, she has so much passion that she chooses to reside within the neighborhood. Believing in “every day is precious,” Anne offers a timeless alternative to traditional fine jewelry by creating fine-jewelry pieces that can be worn every day, leaving her clients feeling “precious every day,” with price points ranging from $200 to 20k to suit any occasion. The Holiday Evening Glam collection features one-of-a-kind rings, rose-cut diamonds and sapphire hand selected by Anne herself. The Bamboo and Stardust collection is where one can find statement pieces made with18-karat yellow gold with diamonds. Many of Anne’s collections are organically inspired by nature, including the newest Petal Collection (inspired by flowers). Handicapped now, my favourite among them all has to be the Signature Wrap Bracelet. Made from the protective and shielding Pyrite gemstone, Anne Sportun‘s Signature Wrap bracelets are not only simple and elegant, they are also durable. This saves me a lot of time.The gemstone wraps come in various colours to match any and every one of your outfits. Anne continued pursuing her dreams and founded her brand in the 1980’s with the opening of her first atelier in Toronto. With such a strong and solid base, Anne embarked on a long beautiful journey and a career that has continued to evolve and prosper over the last 25 years. After thirty years, Anne has never grown sick with jewelry & fashion; in fact, she has so much passion that she chooses to reside within the neighborhood. Believing in “every day is precious,” Anne offers a timeless alternative to traditional fine jewellery by creating fine-jewelry pieces that can be worn every day, leaving clients feeling “precious every day,” with price points ranging from $200 to 20k to suit any occasion. 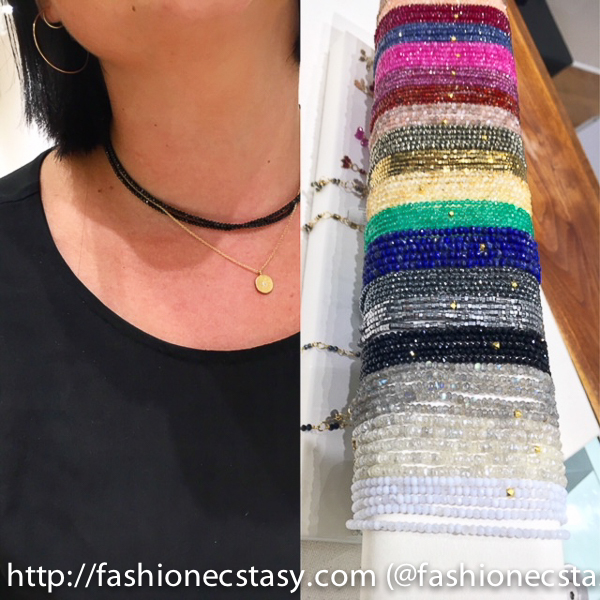 This saves me a lot of time.The gemstone wraps come in various colours and can be worn 3 ways ( A bracelet, a long necklace and/or a doubled up necklace) to match any and every one of your outfits.